John Bul Dau was born in 1974 in what is now South Sudan. In 1987, when John was 12 years old, his village, Duk Payuel, was attacked in the middle of the night by government forces from northern Sudan and his family was scattered due to the violence. Mr. Dau consequently spent three months traveling on foot to neighboring Ethiopia in search of safety. Four years later violence and unrest disrupted his stay in Ethiopia and Mr. Dau along with numerous other Sudanese youths once again took off on foot, this time walking all the way to Kakuma refugee camp in northern Kenya. The youths’ heroic efforts to find safety and some normalcy in their lives, such as being able to attend school, made the international press and the group became known as the ‘Lost Boys’ of Sudan. In 2001, Mr. Dau was one of 3,800 Sudanese refugees to enter the USA and one of 140 settled in Syracuse, New York. In the USA, Mr. Dau worked tirelessly to obtain more education and to raise funds for others like him. He also managed to bring his sister and mother to the USA. 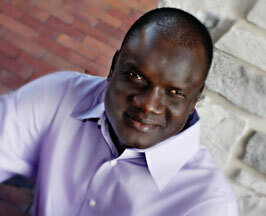 In 2003 he helped establish his first non-profit organization, the Sudanese Lost Boys Foundation of Central New York. The charitable foundation raised over $35,000 for medical expenses and books for Lost Boys living in the USA. In 2005, Mr. Dau was instrumental in founding another non-profit, the American Care for Sudan Foundation, through which he has raised more than $1.8 million to build and operate the Duk Lost Boys Clinic in Southern Sudan. In addition to general care the Clinic has an initiative to repair eyesight and curb blindness in the region. Mr. Dau was one of three Lost Boys featured in the award-winning 2006 documentary God Grew Tired of Us and co-authored a memoir by the same name that was released by National Geographic Press in 2007. He is also the President of the John Dau Foundation which was established in 2007. The foundation seeks to develop heath care facilities in several counties in the state of Jonglei in South Sudan and is the subject of a 2013 award-winning documentary, Duk County: Peace is in Sight in the New South Sudan. Mr. Dau has been recognized with more than 55 awards including a National Geographic Emerging Explorers Award. He was named a Volvo for Life Award finalist in the Quality of Life Category in 2008. Mr. Dau graduated with a degree in Policy Studies from Syracuse University in 2011, the same year that South Sudan gained its independence.